Uttar Pradesh Basic Education Board (UPBEB) is going to conduct an entrance examination in regards to BTC which stands for Basic Training Certificate. Online registration for taking part in the examination is going on from the forthcoming dates which will be mentioned on this page as soon as available. Your presence on this page is highly necessary to download advertisement concerning UP BTC Online Application Form 2019. Not yet, the commencement of online application form submission has started now. You may download Uttar Pradesh BTC deled Notification 2019, too, that contains the complete guide on how to apply. You can also get the last date for online application form is visible on this page after the successful announcement by the board. Further details or the latest news about Uttar Pradesh Basic Training Certificate Online Registration Process, please continue reading. Latest updates: As per the News: यूपी डीएलईईडी 2019 के लिए प्रवेश May 2019 से शुरू किया जा रहा है। यूपी डी.ईएल.एड अधिसूचना 2019 आवेदन जारी। प्रिय उम्मीदवार कृपया फॉर्म जमा करने के बाद कृपया ध्यान रखें कि आप कुछ भी नहीं बदलेंगे। डेलीड का सत्र जुलाई 2019 से शुरू किया जाएगा। The Last date for the Online form is updated soon. The up deled Online Application form is in the process and can be downloaded from here the Final Print Out which is going to be Published soon till then stay with us. The official Department has released the New Session Online Application from Check the image and get other Sarkari Result details latest job news or look out the complete website. Those Candidates who were deprived of being a part of the D.El.Ed. (BTC) 2019 now able Apply online for the UP D.El.Ed. (BTC) 2019 from here. The UP DELED 2019 New Session will have the Doubled of seats than before i.e from 81600 to 1,59,450. The Uttar Pradesh Basic Shiksha Parishad soon started the New Uttar Pradesh BTC Session (2019) Application Process. We concern about you in preparing for the govt exams so here we are updating the all government jobs information and solved question papers for free. Diet and college application form will be Separated. The Online application will be determined totally on the basis of College merit wise. Candidates Merit will make as per the Reservation Rules and regulations. UP BTC 2019 Admission Form Latest News Update: BTC which is now named as D.El.Ed Online registration process will be started soon again. Get other details from the below image and apply online from the link given below. बेसिक एजुकेशन काउंसिल जल्द ही बीटीसी (BTC) से होगा डी.एड.एड. (D.El.Ed). Latest Proposal for BTC 2019 has been sent to the Government. UP BTC Online Application will be started 3 Days after the Approval from Cabinet. According to the Uttar Pradesh BTC latest news, the information about the process of fill the online forms via UP deled Online Registration 2019 can be carried out by using official sites that are shown above. Before we get involved in this more, let’s talk a bit about the Basic Training Certificate and its role in this recruitment. Actually, the Basic Training Certificate is a kind of certificate that comes into play where there is a requirement of Teachers in various colleges after the completion of the Graduation. By qualification of this certificate, it becomes easier for the postulants to get jobs in the teaching department. Candidates being interested in such type of job criteria can download UP deled Online forms 2019 using the official link furnished at the bottom. After the successful participation in the Uttar Pradesh BTC Online Registration Process, the candidates will be given a chance to appear for the exam (conducted offline/ online) for which, the BTC Admit Card will also be provided. Kindly, read the following page and know more about UP BTC 2019 Application Form precisely. If you really want to take part in this recruitment via Uttar Pradesh BTC Admission 2019 process, you are required to meet the following eligibility criteria as per the rules of the board. The Uttar Pradesh Basic Training Certificate is a 2-year certificate and the reason why it is conducted has been delivered above. You should have the required qualifications from the recognized university for participation in this entrance exam. The Online Forms for Basic Training Certificate in Uttar Pradesh can be submitted if the requirements mentioned below are successfully submitted or met or satisfied, otherwise no one can do that. A Graduation Degree in the relevant subjects from a recognized board with 50% marks is required to fill the applications. Age of the students is supposed to be between 21 years and 31 years. Written Exam and Interview are the modes of the selection of suitable contestants. UP BTC 2019 Admission process started by State Council of Educational and Research Training of Uttar Pradesh SCERT. This department provides Government Jobs on a Primary level by inviting all the candidates through UP BTC Application Form. Lots of qualified and dynamic students want Admission in 2 yrs of Basic training Certificate BTC course.b.el.ed or in Diploma in Elementary Education, these both course imparted by DIETs and District Resource Centres (DRCs) in Uttar Pradesh by UP D.El.Ed. Entrance Test which will be organized by Lucknow college and other districts in Uttar Pradesh. 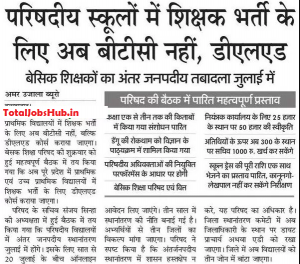 The admission notification of Uttar Pradesh D.El.Ed has been issued soon. To apply online regarding this Basic Training Certificate for Primary Teacher jobs in Schools, you have to visit the official website that is upbasiceduboard.gov.in or upbasiceducationboard.in. From there, download Uttar Pradesh Basic Training Certificate Exam Notification and read it and then fill the online application form before the last date. You can use the above-mentioned links and catch more about UP deled Online Application Form 2019 or Uttar Pradesh Basic Training Certificate Online Registration Process. Stay connected with Total Jobs Hub for upcoming updates. Please Note: There Are Total 1,59,450 BTC (Now D.El.Ed) Seats. In the DIET 10,500 and 1,48,950 seats in 900+ private colleges for BTC Courses. b.tc online registration kb se honge plzzz reply me. b.tc ke form online kb se honge plzzzz reply me. sir, plzz kuch to btaiye b.tc form kb se online honge phle January kaha gya tha ab to January aa gyi h phir bhi form kaha hai abhi tk form ni aaye hai .